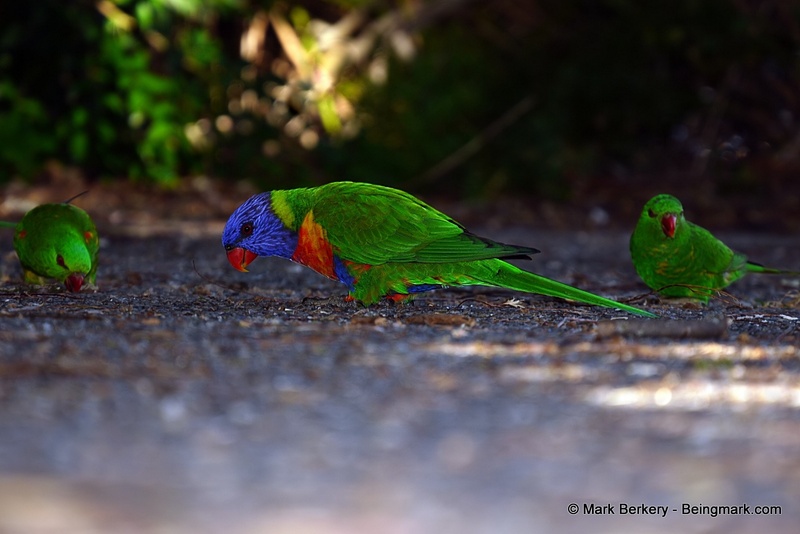 Rainbow Lorikeet strutting about a corner of the driveway, being its beautiful colourful self. 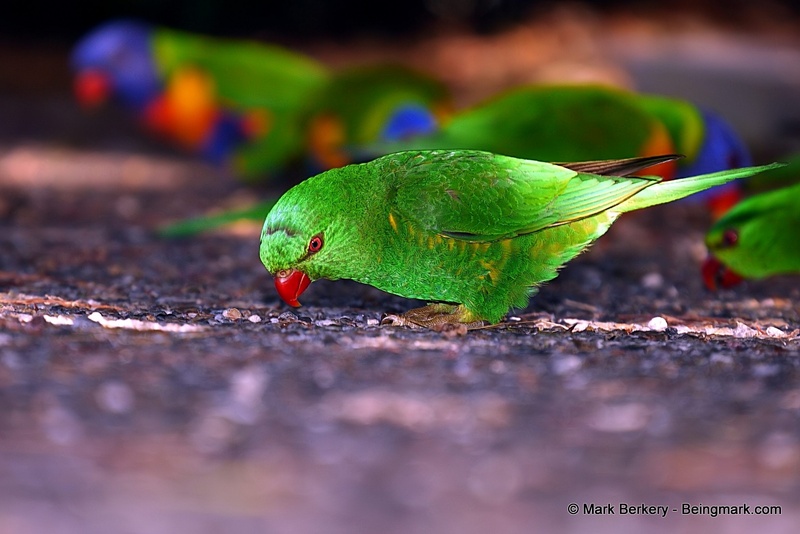 Scaly-breasted Lorikeet, taking time with the crumbs lying about. A little sunshine through the canopy lighting it up. Rainbows in front of the water bowl, an easy gathering, didn’t mind me at my distance. Green Scaly Breasted cracking I don’t know what in its beak, little beauty. 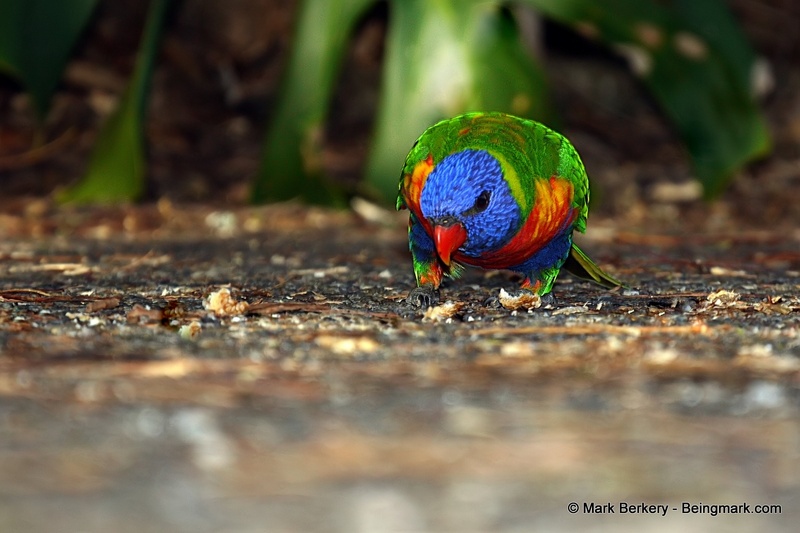 A lone magical Rainbow, enjoying the supplement to its diet of nectar from the nearby winter flowering trees. Alert, did I move too fast, or is it the lookout … for both kinds. They would be organised, if only loosely. 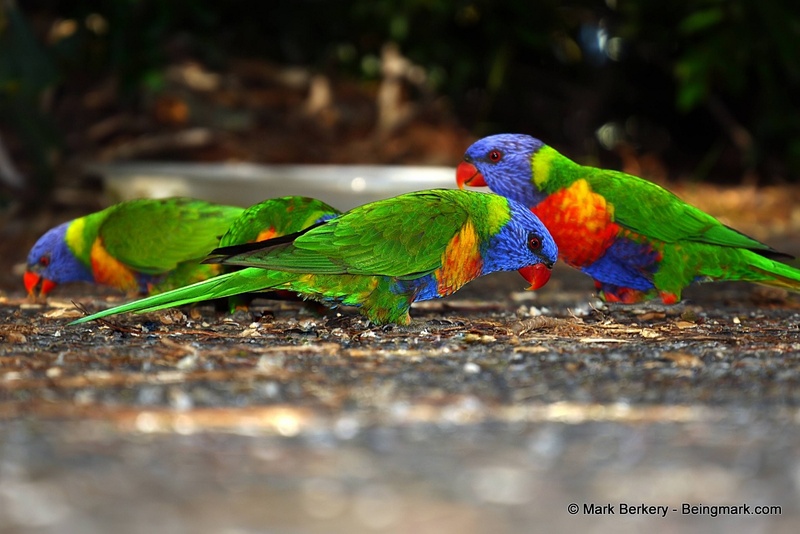 … rainbow in the sense of these colourful Rainbow Lorrikeets, and the Green Scaly Breasted Lorikeet. They came to the garden recently, end of summer, so I started feeding them. Noisy creatures, frequently screeching loudly to each other. Piercing to the heart of me. Flashing vivid colour across the garden in the warm winter sun, a delight to the eye. To the being that can be delighted. Other birds come and go, the ever present Pigeons, and the lone shy Ibis. Each comes with its own characteristics. Pigeons prefer the smallest pieces, like seeds. While the lone shy Ibis will take the biggest, or the lot. The noisy Myna prefer soft bits it can shake about as if a worm, calling out to me on sight. Chattering, prancing, screeching, preening, honking, bickering and playing for a meal. Only the best bread for my garden friends, no cheap processed white. It’s the least I can do for the pleasure of their company. A pleasure, without excitement, not to be missed. Yes it is … Thanks Snow. 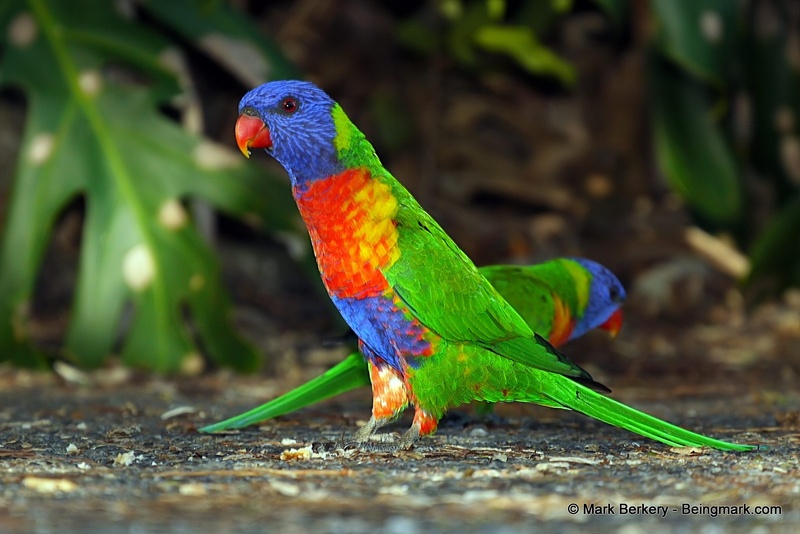 I love the rainbow lorikeet, gonna get one as a pet even if the nectar is dear. Maybe the RSPCA has something you can adopt. A beautiful bird. Good luck resolving that conflict, saving will surely help. And wants can change. Yes, Brisbane. Spiders are mostly harmless, some are even amusing – like the jumping spider. Everybody has fear of something, it doesn’t have to persist though. If only mine would go, :( but I love your pictures regardless. 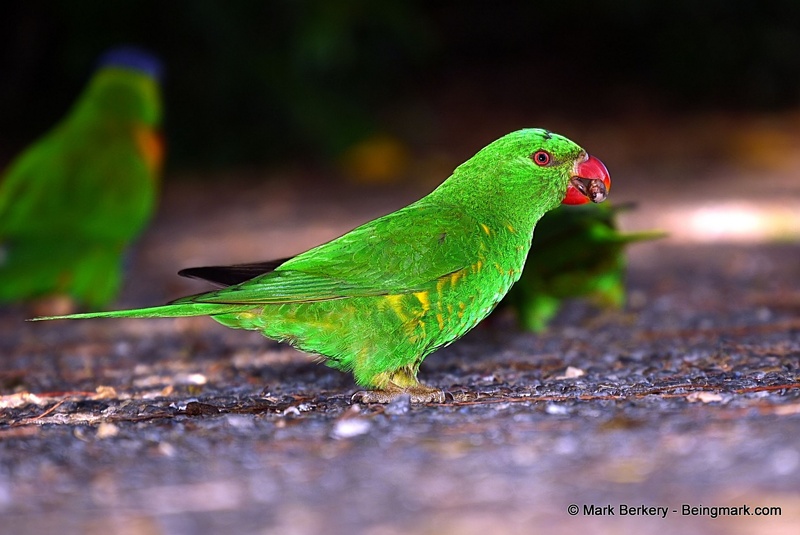 Gorgeous birds, and a fond reminder of a childhood stay in Australia. Awesome photos as always, Mark! Such colourful iridescence! My goodness. 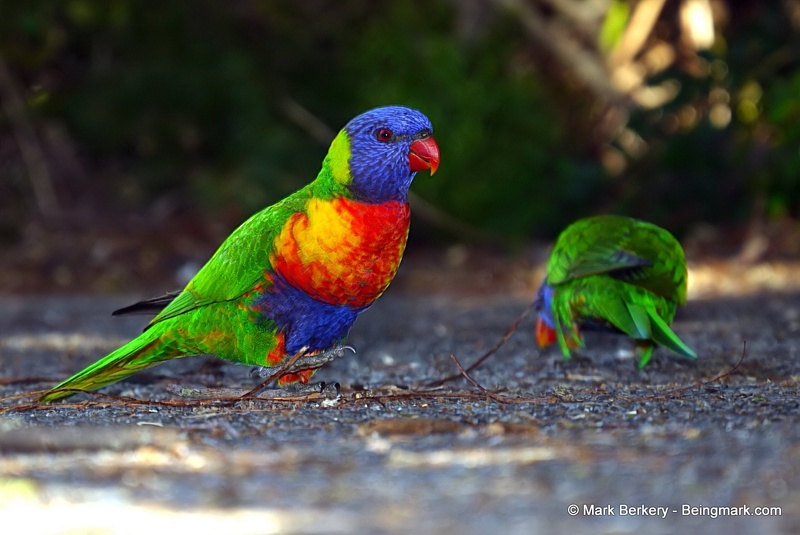 These birds are so colourful. A treat for the eye.